Many reasons may lead to your iPhone data loss, such as iOS upgrade failure, accidental deletion, water damaged device, iPhone stuck in recovery mode, forgotten your passcode, etc. Worse more, you even haven't made any iTunes backup. Under such circumstance, what will you do to recover lost or deleted from iPhone? Now just keep on reading the post here and you'll know two possible ways to recover iPhone data without iTunes backup effectively. 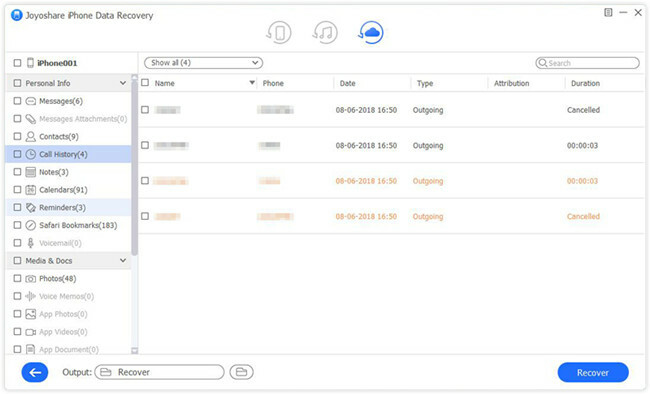 If you have lost iPhone data with no iTunes backup, the first efficient solution is to use a third-party professional iOS data recovery tool. 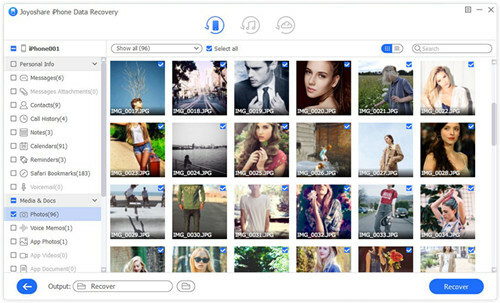 Here I strongly recommend Joyoshare iPhone Data Recovery (or Joyoshare iPhone Data Recovery Mac) to help recover deleted or lost data from iPhone directly on PC/Mac. This smart iPhone data recovery software is competent of retrieving more than 20 types of lost data such as text messages, contacts, photos, Safari history, calendars, WhatsApp/Kik/Viber chat history and many more, no matter how you lost them. You can also preview and recover them selectively as you like. It supports a wide range of iOS devices, from the first iPhone 3GS to the latest iPhone XS/Max/XR, all iPad and iPod touch. Now let's come to the step-by-step guide on how to recover iPhone data without iTunes backup - from iPhone directly under the help of Joyoshare iPhone Data Recovery. 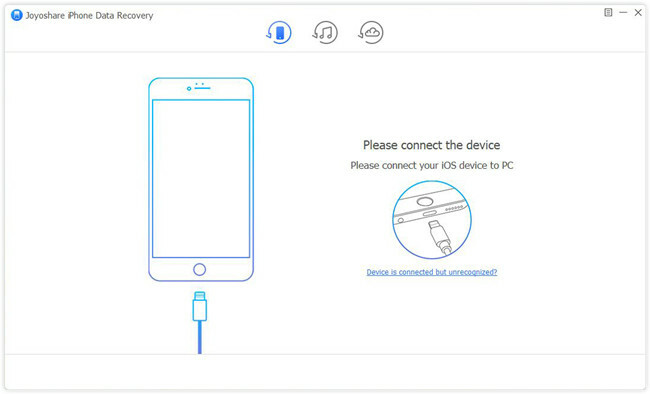 First of all, go to the download page of Joyoshare and select iPhone Data Recovery to download and install it on your computer. Simply open Joyoshare and use a USB cable to connect your iPhone to the PC or Mac. When Joyoshare successfully detected your device, it will enter the "Recover from iDevice" mode by default. 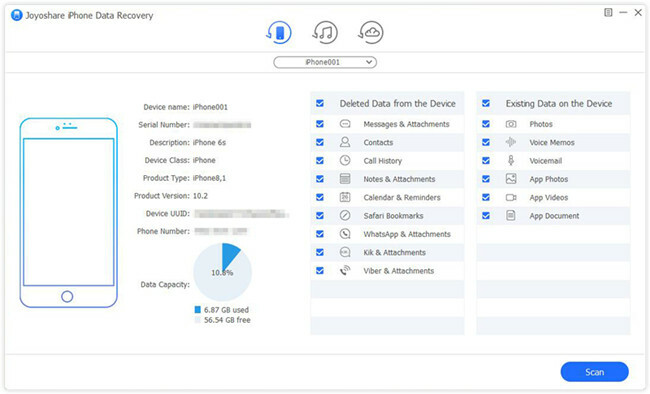 Here you can see all the basic info of your iPhone as well as all data types for recovery. Tick the ones you want to recover and then click the "Scan" button to start to analyze and scan the lost data. Wait a while until the scanning process comes to an end. Now all the recoverable files will be shown in types. Choose the category on the left sidebar and preview them one by one. You can also preview the specific ones by filtering out "Only show the deleted" option or search keywords on the search box. Next hit the "Recover" button to let Joyoshare recover and save all selected ones to the local folder of your computer. 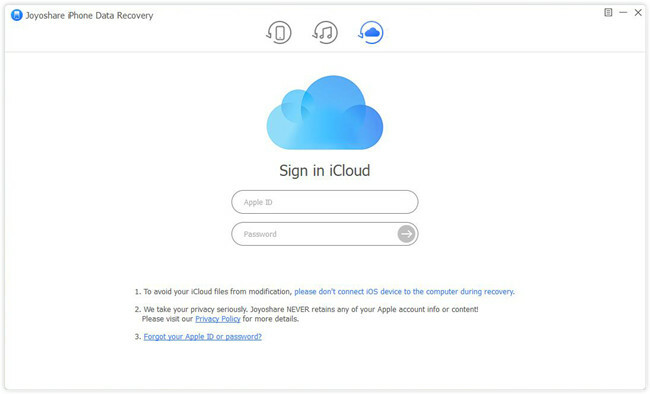 The second method to retrieve lost data from iPhone without iTunes backup is to extract and restore iCloud backup files on the premise that you have turned on iCloud backup for your iPhone data. 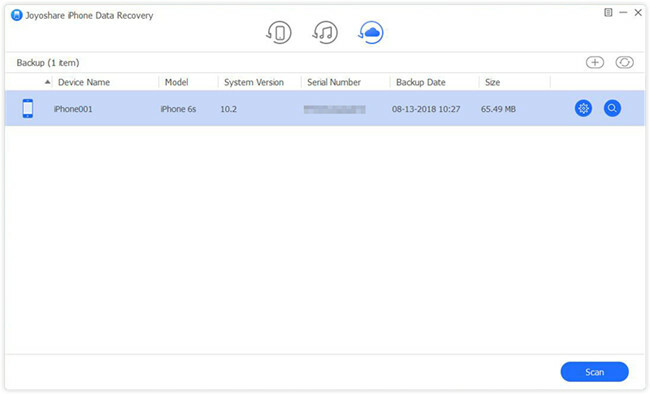 At this time, you still have two options to reinstate iPhone data from iCloud backup: one is to selectively recover lost file you want with real-time preview by using Joyoshare iPhone Data Recovery; the other is to restore the whole iCloud backup directly to your iPhone. Next you can see the detailed instruction in the following parts. Run Joyoshare app again and move to the "Recover from iCloud" mode on the top menu bar. Now you're asked to enter username and password to sign in your iCloud account. Do it as required because Joyoshare will never record any info of your privacy. See also: Forget iCloud Password? Look at Here! After logged in iCloud account, you'll see all the iCloud backup files here. Choose one that may contain the lost data and then click the Download icon beside it to download all lost files. Then click the "Scan" button to extract them. Once the scanning is done, you can now preview them and select the lost files you would like to recover. Afterwards, just press the "Recover" button and all the selected files will be recovered to your computer. Open your iPhone and then tap on Settings > General > Reset > Erase All Content and Settings to factory reset your iPhone. When it powers on again, follow the onscreen Setup guide to start setting it up. 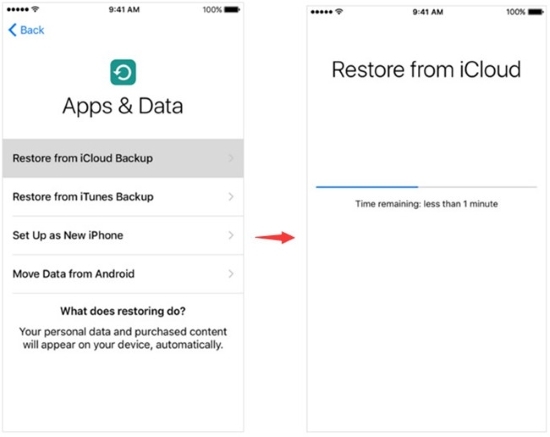 When it comes to the "Apps & Data" screen, tap on the "Restore from iCloud Backup" option. Next enter your Apple ID and passcode to sign in your iCloud account. Choose the most relevant backup file to recover. Wait a while until the progress bar is completed and then your data will be restored to your device. Note: By using this method, you need to efface all contents of your iPhone, so please make a backup for it to avoid further data loss, or just choose Joyoshare iPhone Data Recovery to recover lost iPhone data without iTunes with the instruction above.